Just listed: this late-model used 35' Everglades boat for sale! : Atlantic Yacht & Ship, Inc.
Just listed: this late-model used 35′ Everglades boat for sale! 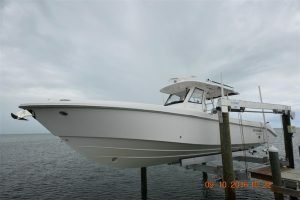 Bill Leonard has a new listing: a beautiful used 35′ Everglades boat for sale in Marathon, Florida! In the first place, this used 35′ Everglades boat has been kept like new. All in all, this is a high-end fishing machine. This model is the largest boat in Everglades’ fleet, their “flagship” so to speak. As a matter of fact, this boat is super sea worthy with its deep-V hull. Furthermore, Everglades uses a proprietary RAMCAP construction process which makes this boat virtually unsinkable! This beautiful used 35′ Everglades boat is loaded with upgrades, amenities, and features. Also, she has an innovative windshield / T-Top which has become a trademark for the manufacturer. A taste of the features includes flip-up bolsters, electric high-low bow table, and foldaway stern seating. For the fisherman she has two live-wells, forward fish-box/cooler and aft bait freezer. A clever foldaway seat on the rear of the bait well doubles as fighting chair. With triple 300 HP Yamaha engines she can top out at over 45 knots! For more information on this beautiful used 35′ Everglades boat for sale be sure to contact Bill Leonard today! Just listed – this late model 65′ Sunseeker 2016 yacht for sale! It’s not too late for Holiday yacht deals!